Beautiful Annie certainly looks comfortable in her new home! 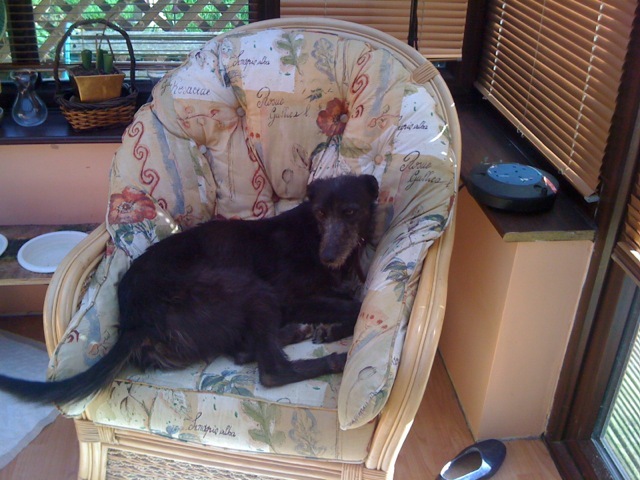 She was one of 4 Irish lurchers that came to us unhappy, scared and underweight. Luckily she was able to go into a foster home where her natural, naughty, personality soon shone through. She has been one of the most funny, charasmatic dogs we've had here at DAWG, often stealing anything she could get her paws on...including a fresh fish from the sink where her foster-dad was gutting them! We hear she has carried on her cheeky ways in her new home, but she's forgiven as she is such a beautiful character, inside and out.